A madman is kidnapping women to hunt them for sport. Detective Janine Postlewaite leads the investigation into the disappearance of Samantha Willis, determined not to let another innocent die on her watch. The killer's newest prey isn't like the others. Sammi is a cop. And she refuses to be his victim. 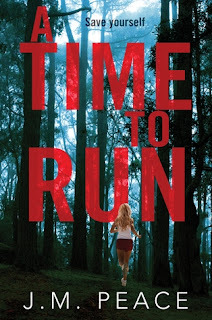 This was a fast-moving Australian crime debut that dialled up the thrills and a page-turning atmosphere while leaving me feeling a little wanting when it came to character, especially early on. The plot is one you may have seen in episodes of shows like Law & Order: SVU in recent years: a madman abducts innocent women and takes them to a remote, forested wilderness to 'play' by releasing and hunting them at his leisure. Then the latest kidnapped woman has enough courage/moxie/luck to survive and it becomes a race against time as the cops try to close in before she's killed too. So far, so one-hour television crime drama. The twist here in Peace's debut is that the latest victim is herself a cop. So we have cops trying to find out what has happened and identify a killer, and a cop struggling to survive inside his sick 'game'. It's an intriguing and potentially powerful set-up, though Peace - herself a former policewoman - has a few rookie storyteller stumbles in the execution, which dilute the depth and strength of her tale. There's a tendency to info-dump and spell everything out for readers, in straightforward prose which reads a little cliched at times rather than having subtext or energy to it. Perhaps because of this, the characters seem a little 'thin', caricatures or cyphers rather than rounded human beings that draw you into what's happening in their lives. Fortunately the set-up is intriguing enough that there's plenty of 'I wonder what'll happen?' tension and page-turning drive to pull readers through, despite these flaws. Peace crafts a good sense of pace in A TIME TO RUN; I found myself whirring through the pages even as I was sporadically pulled out of the story by some of the things mentioned above. There's plenty going on as Constable Sammi Willis tries to survive in the Australian bush, and Detective Janine Postlewaite battles all sorts of challenges to investigate her disappearance. Overall A TIME TO KILL improves throughout, and builds to a very solid finish. A good 'airport thriller' or 'beach read' that I could being successfully adapted into an exciting film or TV movie. It has a good hook, an atmospheric small-town and rural Australia setting, and plenty of action.